There is nothing like a blog post a-la-minute! We are literally waiting to dig in and gobble up this de-lish salad as soon as I snap a shot. Rosemary infused grilled lamb chops, summer corn saute and Tuscan Panzanella Salad all served “al fresco” on the patio for dinner tonight. A great bottle of Pinot, candlelight and a cute hubby to dine with to-boot. LISVG. (Thanks to JoJo for that acronym). 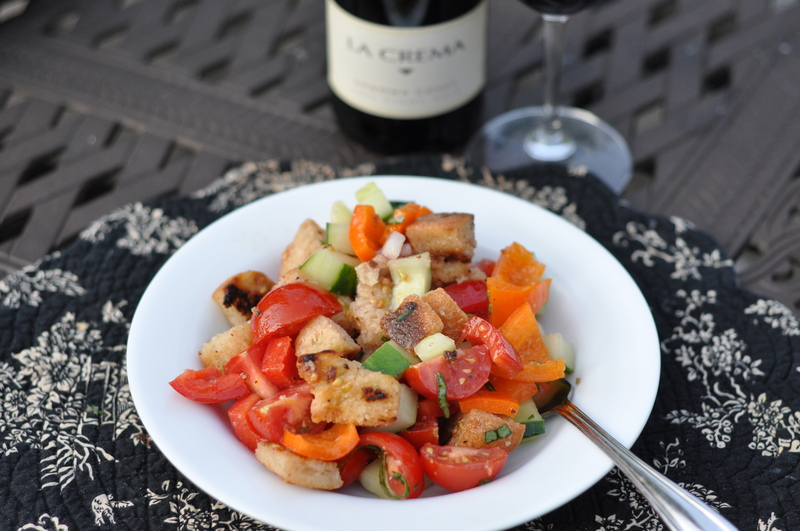 Panzanella salad is a bread and tomato salad originating in Italy. 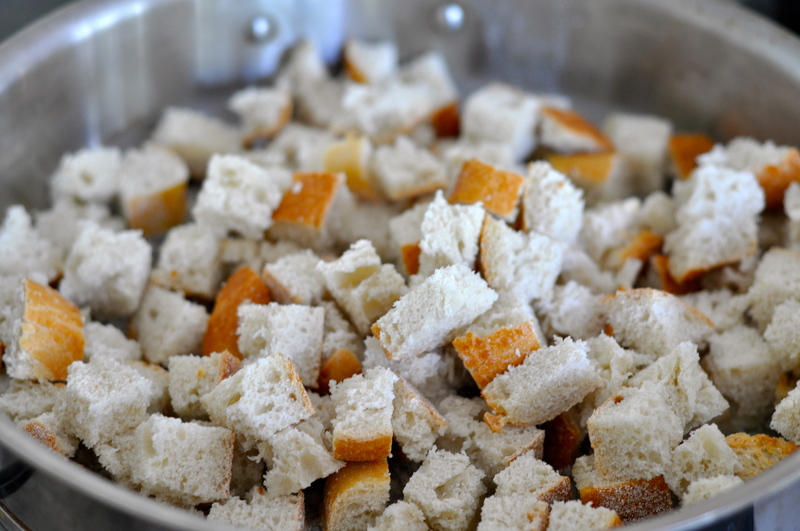 The Tuscans don’t like to waste even a morsel or crumb of good bread, so this wonderful rustic salad was created centuries ago to use up all the day-old bread sitting around the villa. There are loads of panzanella salad recipes floating around. 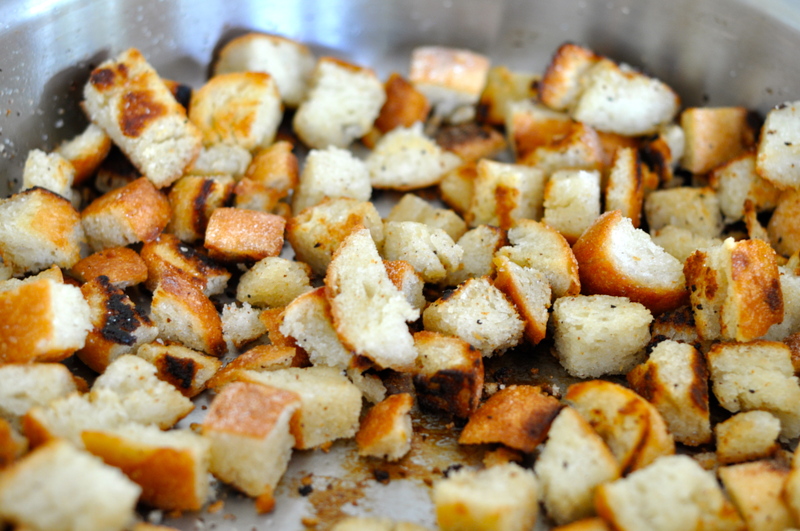 The basic approach is to get some great in-season summer vegetables (must include LOTS of tomatoes), make some homemade grilled croutons from the leftover bread and douse all with a simple vinaigrette. Although I did not do it this evening – you can always add cheese and olives too – it’s a salad for heaven’s sake. It’s really impossible to describe what happens when you pop a forkful of the homemade croutons and tomatoes soaked in the vinaigrette into your mouth. I’ll just have to let you experience that yourself. 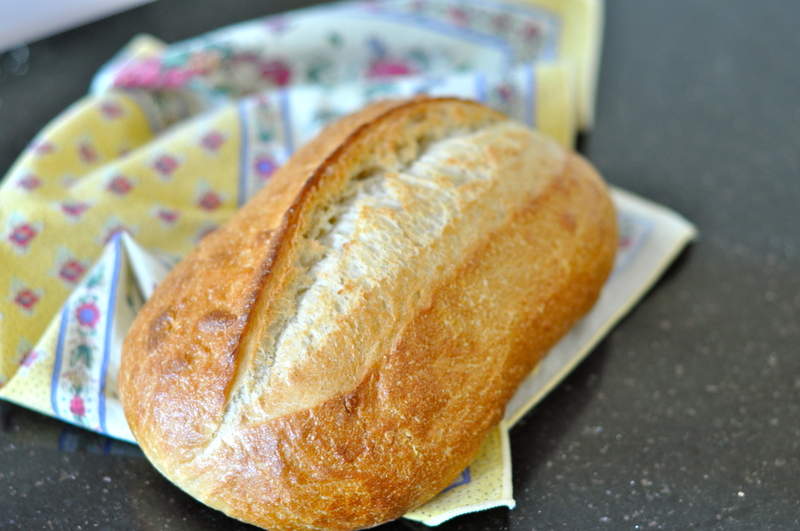 Start with a loaf of rustic sourdough bread. Melt 2 TBSP butter and 2 TBSP olive oil in a saute pan. 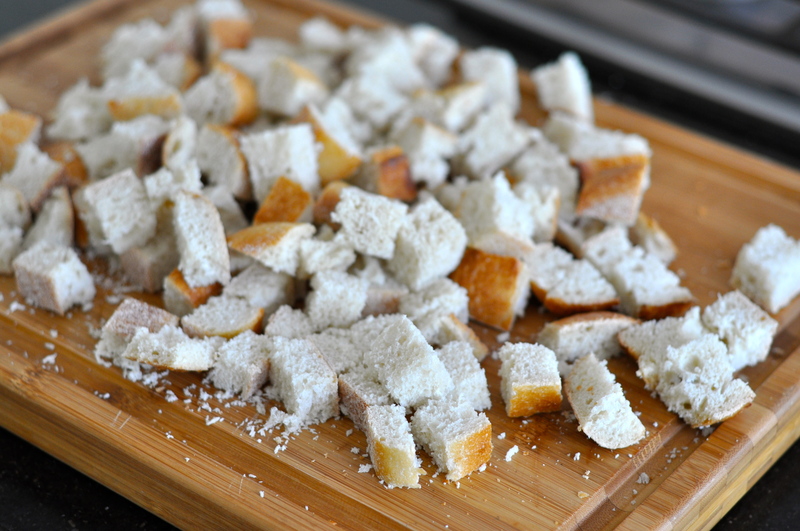 Add the bread cubes. Salt to taste. Saute over medium-low heat for about 5-10 minutes until cubes are toasty and brown. If you start nabbing a bite to taste – be sure to leave some for the salad! 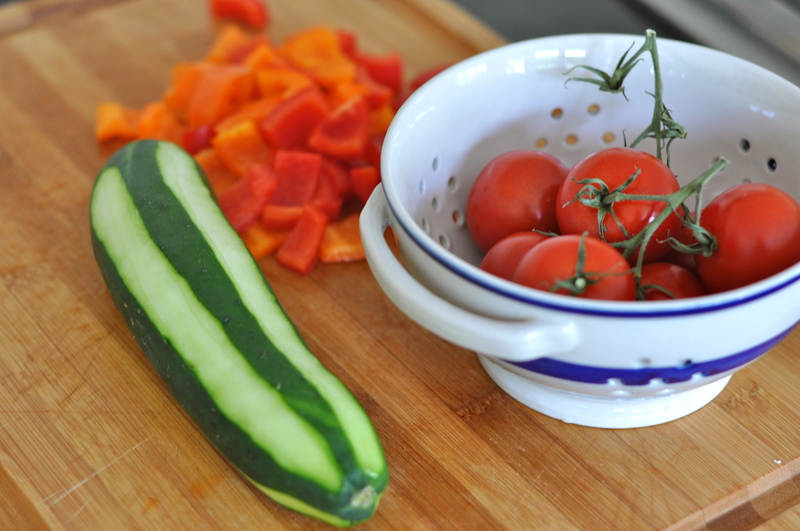 I like the way it looks to leave a little skin on the cucumber. I just took a vegetable peeler and peeled off every other row. Chop the vegetables and basil, whisk together all the ingredients in the vinaigrette, throw everything in a big bowl with the home made croutons and pour the vinaigrette over all. Enjoy!! Ooooh…is this what my groom was raving about on Sunday evening? Looks fabulous! We had the Greek version on Sunday Missed you tons! I’ll make it again for you next time.